The Secret of Staying Connected No Matter Where You AreSafe, Secure Recharging at All Times- Tired of not knowing which adapter a country takes?- Still carrying 4 adapters and one USB charger for every device in your bag?- Ever been shocked as you touch those cheap plastic travel adapters?- Blown a hotel fuse or fried a device because of electrical spike or surges?Pac2Go Introduces a Universal Travel Adapter with Quad USB PortsA compact, go-anywhere device conveniently provides safe, secure power in over 150 countries simultaneously charging up to 5 devices. Our smart charging delivers the fastest charge possible. The surge, spike and overcharge protection safeguards your valuable devices. 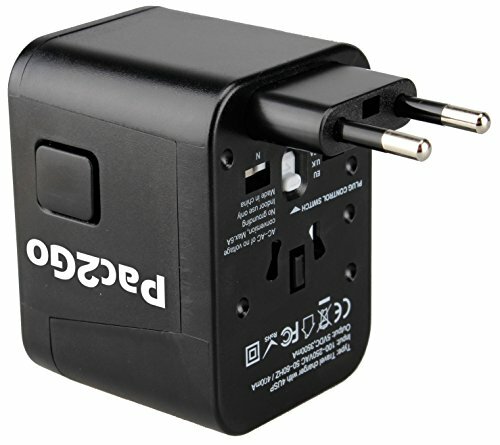 A defacto travel wall charger, it is great for powering smart phones, tablets, mp3 players, eReaders and notebooks. 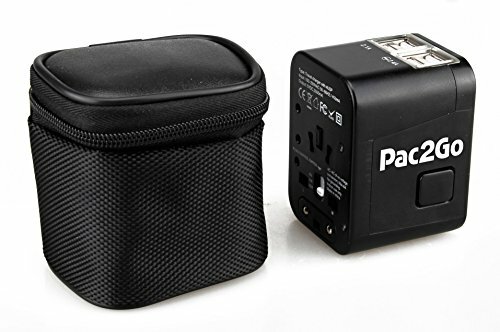 The all-in-one integrated plugs eliminates the need for multiple travel adapters.Compact, Lightweight and PortableThis 2.5″ cube with zippered case fits easily into your computer bag or travel case replacing a number of plugs and chargers. 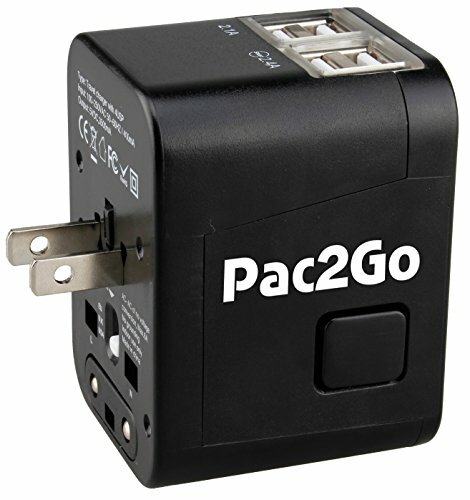 It fits any hotel or ship outlet. Super fast USB charging with over charge protection makes it perfect for domestic and international travel.Supported CountriesArgentina, America, Australia, Belgium, Botswana, Brazil, Cambodia, Chile, China, Denmark, Dominican Republic, Egypt, England, Ethiopia, Europe, Fiji, France, Germany, Greece, Hong Kong, Iceland, India, Indonesia, Ireland, Israel, Italy, Japan, Jordan, Kenya, Korea, Mexico, Middle East, Morocco, Myanmar, Namibia, Netherlands, Nepal, NZ, New Zealand, Nigeria, Norway, Peru, Philippines, Portugal, Rowanda, Russia, Scotland, Spain, South Africa, Sri Lanka, Switzerland, Tanzania, Thailand, United Kingdom, Vietnam, ZambiaThe days of the bulky heavy electric converters are over! 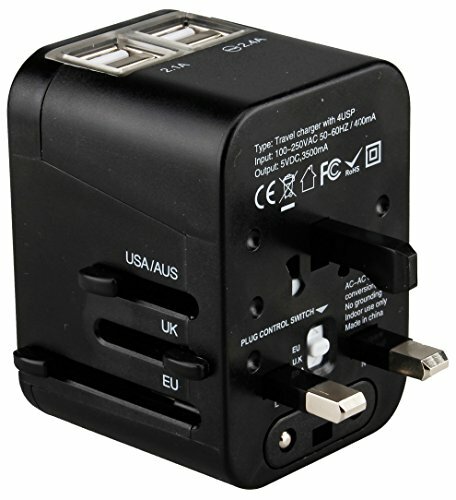 Slide out world travel plugs for US, EU, UK and AU with an 8 hole input socket compatible with every international standard 2 and 3 prong plug. The perfect worldwide traveling companion for men or women. Almost complete global coverage. At home in cities like London, Paris, Singapore or Dubai as well as the European, African, American or Asia back roads. 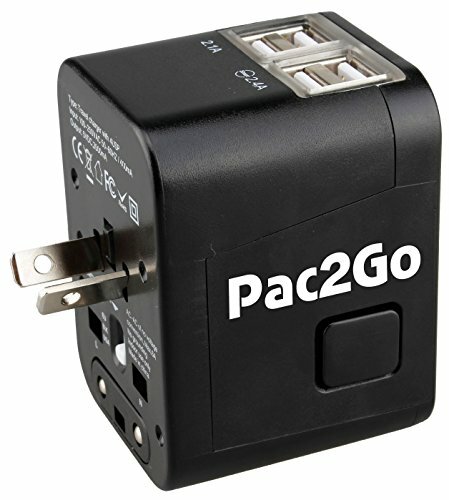 Call 719 822-2001 or email support@pac2go.com to verify your specific travel needs. AC voltage from 100 through 250 Volts, 1500 Watts max at 250 Volts with a built-in 6 Amp safety fuse. Internal spike and surge protection circuitry safeguards your valuable devices. Worry-free charging for your Apple MacBook, Google Chromebook, Microsoft Surface, HP, Dell, Acer or Lenovo laptop. Ideal for dual voltage appliances like a hair dryer less than 1200 watts, curling iron, flat iron or straightener without the need of a converter or transformer. A sensible protector of electronics. Ergonomic black rubberized oil surface and safety shutter prevents external shock and short circuit. Single piece construction in a compact size and convenient carrying case make it a necessity for foreign or domestic travel. The soft amber lighted USB ports provides a night light. 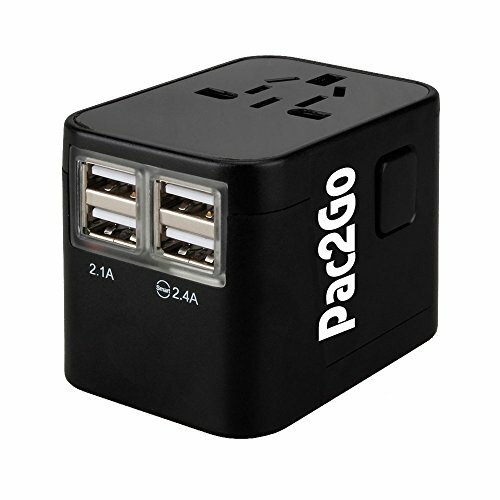 Why purchase even a single multi set individual type adaptors combo kit when you can make your travel bag lighter and less cluttered with just one portable Pac2Go Universal Travel Adapter for your overseas trip? FCC CE RoHS SGS certified and backed with an 18-month guarantee. We promise THE BEST customer service before or after the sale. If you have any problem contact us and we will work with you to resolve the issue guaranteed. Our knowledgeable customer service is based in the USA. Call or email us at 719 822-2001 or support pac2go.com.